It takes more skill to make an indie film than a big budget studio picture. Where a Hollywood production can throw money at a problem, an indie production must work smart. I have started this thread as a place where we can share indie tricks-of-the-trade for realizing big budget production values on a modest budget. Or, as Phil Rhodes so eloquently put it in a recent thread “by the application of hard-won and exquisitely-realized skill.” Posts to this thread should not herald DIY lights, nor lighting a set with practicals alone. The emphasis should be on FILM CRAFT using a basic tool kit that can be carried in a 18’ rental box (say a 3-5 Ton Grip & Electric Pkg.) and powered off the wall or off of putt-putts (no diesel tow plants.) With the newest camera systems that are capable of a fourteen stop exposure range and ASA sensitivities of 1600 without grain you shouldn’t need anything more to get decent production values if you know what you are doing and willing to work hard. I will start it off by re-posting here my post from the thread “Night Lighting - Balloon VS Dino/Wendy's” (http://www.cinematography.com/index.php?showtopic=70842.) This thread is for those productions for which $1500 for a balloon light or a generator to power a Wendy light is simply not in the budget and they have to figure out how to accomplish the same look for a lot less. For example, I would say the smart indie alternative would be shoot his wide establishing shots dusk-for-night and only his close coverage night-for-night. 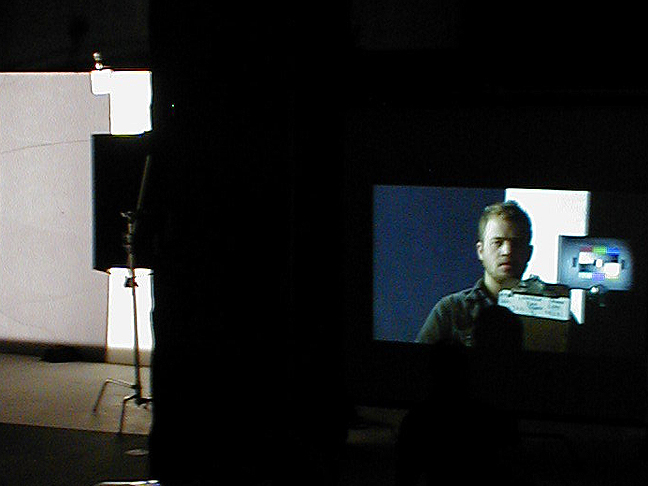 Dusk-for-night, is an important technique for indie filmmakers to learn because it is a means of obtaining expensive looking production values for very little money. 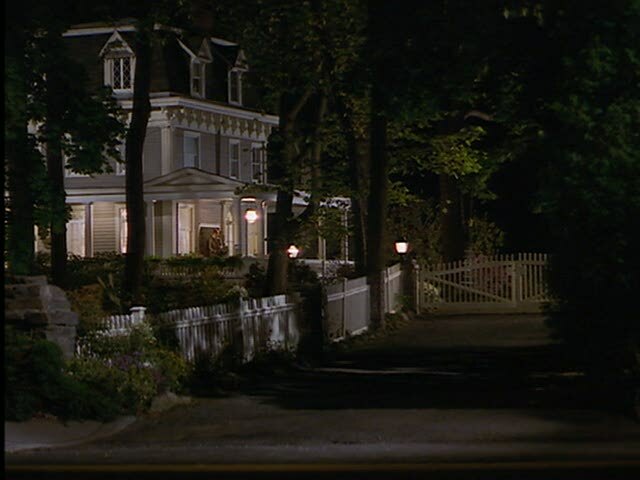 Dusk-for-night uses the fading daylight as an ambient fill to gain a base line exposure in wide establishing shots without using a big source like a balloon light. Typically it is intercut with closer framing shot night-for-night to create a realistic night scene. The advantage to shooting dusk-for-night over day-for-night (the other low budget alternative to expensive night-for-night cinematography on a large scale) is that if you are shooting a house or city street you can incorporate set practicals like window or porch light, car headlights, or even streetlights or raking moonlight in a wide establishing shot. But in order to get the balance right between your lamp light and the fading daylight requires the right location and careful planning. For example, the key to success in shooting the house pictured below dusk-for-night is choosing the right location. To get the subtle separation of the night sky and trees from a dark horizon, you don’t want to shoot into the after glow of the setting sun. Instead you want to find a location where you will be shooting into the darker eastern sky. With dusk-for-night, you have maybe a thirty-minute window of opportunity after the sun has set to shoot the wide master before the natural ambient light fades completely so you have to have everything planned out, rehearsed, and ready to go. In order to get the balance right between the practicals and the ambient dusk light in the limited time you have to shoot the establishing shot, you have to start with larger fixtures and be prepared to reduce their intensity quickly. For instance if you want the glow of an interior practical light raking the lace curtains in a window, start with a PH213 in the practical and 2k Fresnel raking the lace curtain. Wait until the ambient dusk level outside has fallen to the point where the balance between the natural light and your lamp light looks realistic and then roll. To get a second take, open the camera aperture a half stop and drop a single in the 2k head, dim down the PH213, and wait again until the ambient dusk level outside has again fallen to the point where it looks realistic and then roll. If you continue in this fashion with nets after you have exhausted your scrims, and a PH212 when the dimmed PH213 starts to look too warm, you will be able to get multiple takes out of the diminishing dusk light. Likewise with a streetlight or moonlight raking across the front of the house. To create a moon dapple on the front of a house against a night sky, you will need a good sized HMI set on a high oblique angle so that it will rake across the front of the house. Break it up with a branch-a-loris and wait. When the ambient level of the dusk sky has fallen to the point where it looks realistic against the moonlit house and the practical lit interior - roll. You can even add a car pulling up to the house, but you have to be prepared and have enough manpower standing by to dim the practicals, net the lights, and scrim the car’s head lights very quickly. The final touch is to use a graduated ND filter on the lens to darken the sky and balance the camera between daylight and tungsten so that the ambient dusk light filling the shadows is cool and the practicals and tungsten lights motivated by them remain warm but not too warm. Once dusk is past, you shoot the close coverage night-for-night when a package consisting of what you can run on a portable generator will suffice. If you parallel two of the Honda EU7000is generators for 120A output, you will be able to use a 6k HMI for your moonlight at dusk on top of a sizeable tungsten package to light the interior of a house to a high level to match the daylight. For example, the scene below takes place in the middle of a near vacant parking lot of an all night convenience store. The establishing shot of the brightly lit convenience store situated in a wide-open expanse of a empty parking lot at night was shot dusk-for-night because the production didn’t have the resources to light up the parking lot and building to separate it from the night sky. Close coverage was then shot night-for-night with nothing more than a single modified 7500W Honda EU6500is and a small tungsten package of 1ks and 650w Fresnels. Left: Close coverage shot night-for-night. Center: Transformer/Distro provides 60A/120V circuit from Honda EU6500 and compensates for voltage drop over long cable run to set. Right: Operating the Honda EU6500 from behind the grip truck at a distance was all the blimping required to record clean audio tracks. 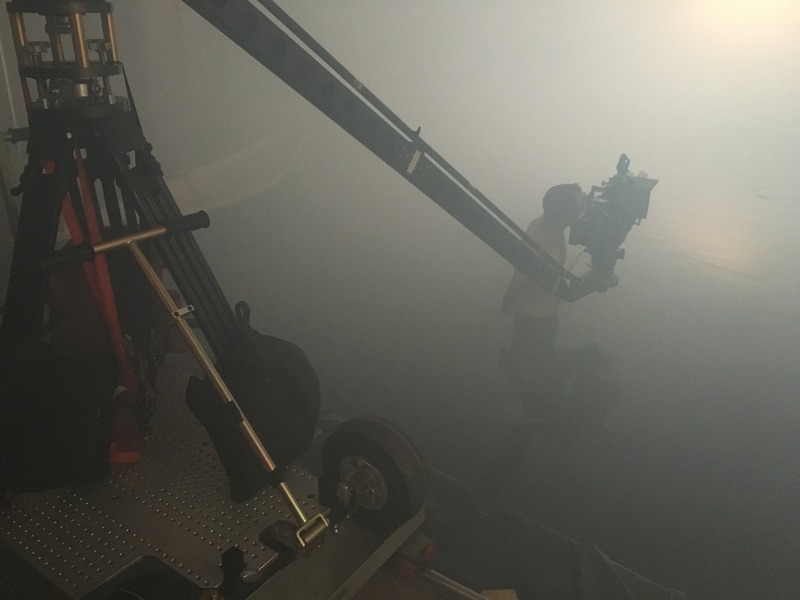 With no building or other sound barrier within a reasonable distance to block the sound of the generator, Gaffer Aaron MacLaughlin put it behind their grip truck as far from set as possible. This was only possible because he used a transformer to step down the 240V output of the generator, and in the process compensate for the voltage drop they experienced over the 500’ cable run to set. Operating the Honda EU6500 from behind the grip truck at a distance was all the blimping required to record clean audio tracks. Thank you very much for opening this thread Guy! I'm shooting a short film that is set entirely inside a car soon. ... The whole film is one setup in terms of camera, mounted to the car bonnet, on a 35/50mm lens to capture a medium two shot of a driver and passenger in the front seat, jump cutting between different days/months. ... For my main lighting setup, I have planned ... to hang LEDs either side of the car, lighting the drivers and passenger side depending on the setup.... This lighting setup will allow me to increase/decrease the intensity of the LEDs either side of the car depending on the look I am going for, whether that be a soft 'overcast' daylight, or a harsher 'sun' coming in from one side of the car, with softer skylight from the other side. ... These are just some of the basic ideas I have had so far. I was wondering if anyone on the forums has had experience lighting this kind of setup with LED lights? Would be great to hear some of the tricks/tools you used to enhance the naturalism in the lighting. I’m afraid your LED 1x1 Panels are not going to be enough to light the interior of the car on day scenes. On car setups like this you face an extreme contrast problem during the day. If you were to expose for your talent, even with the LED panels on, the exterior as seen through the back and side windows will blow out. If you expose to hold detail in what you see outside the car, your talent is under lit and will be underexposed. The problem is that you are shooting into a black hole. To the contrast problem a second problem is that when the windshield glass is backed by black it becomes a mirror and will reflect the sky above. The challenge of these set-ups is that you need to both pick-up the levels inside the car (not easily done with 1x1 LED panels on a bright sunny day) as well as eliminate whatever it is (usually a bright sky) that reflects in the wind shield. Below is a picture of how a big budget movie approaches these problem. Note that they have rigged an 8x8 solid "eyebrow" out over the windshield so that only black will reflect into it. 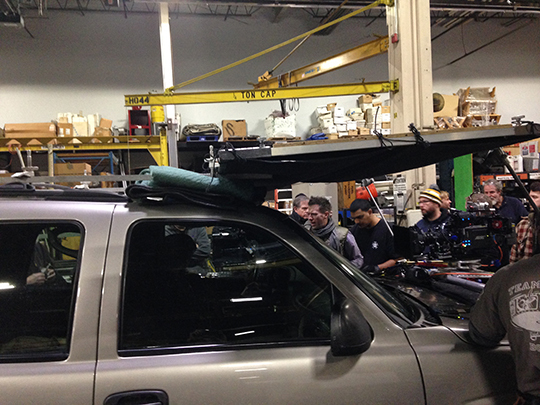 They are also using an Arri M40 4k HMI (equivalent output to a 6k HMI Par) to pick up the interior of the car. 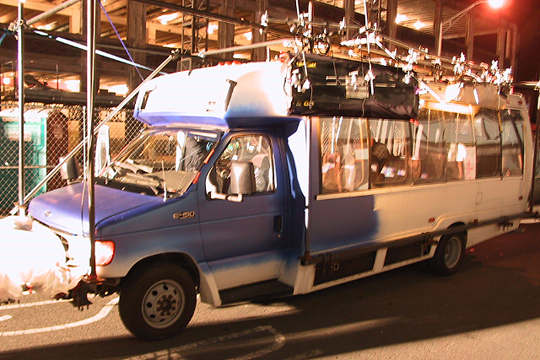 Because all this gear obstructs the view of the driver, but also because it is quite often too much for an actor to act and drive at the same time without getting into an accident, the big movies tow the picture car behind a camera truck with an onboard generator to power the lights. 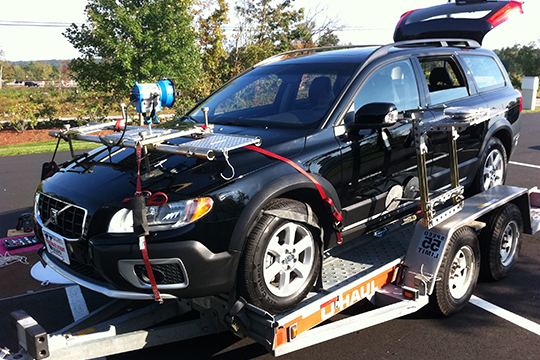 If a process trailer like that pictured above is not in your budget. 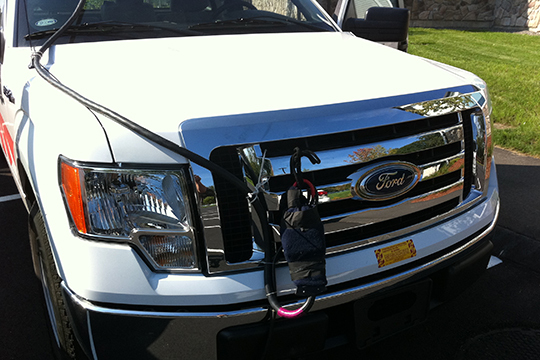 A less expensive alternative is to rent a “car carrier” to tow behind a pick-up truck. A number of low budget indie productions I have worked on have done this with great success. A partially built car process trailer. Rosco Scrim still to be applied to windows and a 8x8 solid tobe still rigged to roof rack. To reduce reflections in the front windshield, you should likewise rig a large solid on top of the car. To also reduce the contrast range inside the vehicle the solid should extend several feet out on all sides as well. This way you will not have to deal with any direct sun on your talent and can light them through the front windshield for better modeling and continuity. To reduce the size of HMI that you need to light your talent, you can reduce the contrast between the interior and exterior of the car as seen through the back and side windows by putting Rosco Srim #3421 over them (any window that will appear in a shot.) This scrim will act like a Neutral Density gel and reduce the intensity of what is seen through the window by allowing a specific amount of light (two stops) through fine holes in the material. When it is slightly over exposed you don’t see the scrim itself but just what is on the other side. It is better than Neutral Density Gels in this situation because it is more pliable and less likely to wrinkle and shimmer as the car is traveling down the road. Even after this contrast control, you will still need a light that is larger than what you can power with an onboard battery or through the car lighter socket. Car lighter sockets are only capable of handling a couple of hundred Watts at most and you usually require at least a 400-575W HMI to light your talent during a day scene. 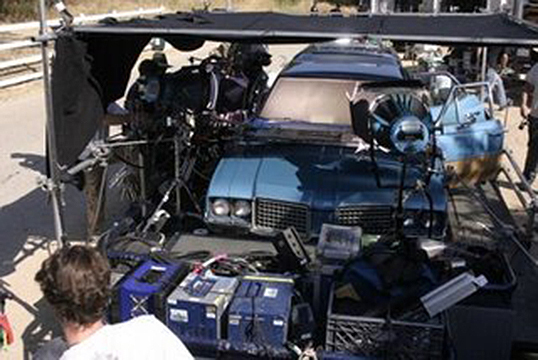 To power a small HMI on the hood of the car you can use a "Battverter" - which is a Battery/Inverter system. 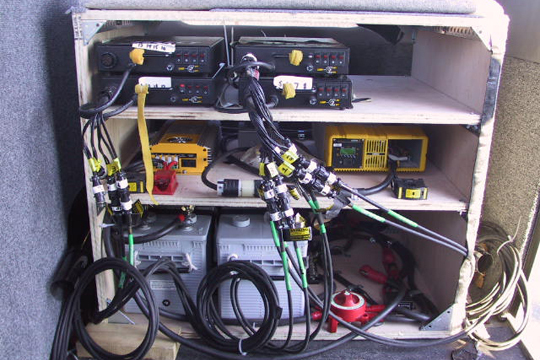 A "Battverter" system consists of a 12V DC power source (usually large Marine Cells), a DC-to–AC True Sine Wave Power Inverter, and a Battery Charger. Wire these components into a Road Case or milk crate and you can put it on the floor in the back of the car. Here are some production stills that show you two Battverter systems I built to run lights in vehicles at various times. 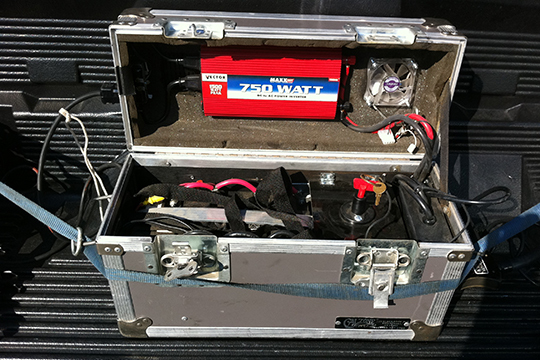 The first is a 750W "Battverter" rig wired into in Calzone case. To maximize the running time on the batteries, I made up a "jumper cable" that we attached to the leads of the pickup truck's battery. That way the engine alternator charged the batteries as they were being discharged by the light. Tie–ing the Battverter into a vehicle engine will extend the running time on your Battverter batteries so much that they may never run out of power. The production stills below show a more elaborate 1800W Battverter system that I built to run 16 - 4’ kinos tubes inside an airport shuttle bus. Use this link - http://www.screenlightandgrip.com/html/shuttlemailintro.html - for details on how we wired it into the shuttle bus. the alternator is large enough to take the load without burning out. Finally, You have to be really careful when choosing a DC-to-AC inverter for film production because there are three basic types of inverters and not all of them are suitable for all types of motion picture lights. For more information on what type of inverters to use with different type of lights I would suggest you read an article I wrote about portable generators that is available online (use this link.) Since inverter generators use the same three types of inverters, the information in the article is applicable to stand alone DC-to-AC inverters designed for use with batteries as well. If you don’t want to tie batteries into the car’s alternator, you should consider using a small portable generator. But, you don’t want to use a generator, like the Honda 2000, whose fuel is gravity fed to the engine. The size head it can power is limited and the fuel will slosh around and cause the generator to run erratically. I suggest you instead use a generator that has an electric fuel pump like the new fuel-injected EU7000. The fuel pump assures that the engine receives a continuous feed of gas. When used with a 60A transformer/distro, the EU7000 is capable of powering HMIs up to 4k and it is so quiet that you will not hear it in the car with the windows closed. As you can see from the picture below of another rig, a generator this size with a 60A transformer/distro is cable of powering even a couple of 2.5 HMIs for daylight fill. A 7500W modified Honda EU6500 powering a couple of 2.5HMI Pars on a car rig. If you have any questions about using inverters or generators, I would suggest you read the article I wrote on the use of portable generators in motion picture production mentioned above. Use this link to read it on-line for free. Guy Holt, Gaffer, SceenLight & Grip, Lighting and Grip Rental & Sales in Boston. Don’t try to light your talent with only practicals. After exposing for the light they throw on the talent several feet away, the practicals themselves will blow out. Not only is supplemental lighting required to light your talent, but practicals must be treated to make them look realistic. I find that practical lamps never look convincing unless one treats the lampshade as well as boost the bulb wattage. That is because if you stop down to keep the shade from burning out, the output of the practical, on the table it sits on or the wall its on, looks rather anemic. I find you get a more realistic look if you boost the wattage of the bulb and line the inside of the shade with ND gel. It is a delicate balance to obtain. You can obtain this delicate balance without a monitor, by using the old school method with incident and spot meters and a selection of practical bulbs including PH 211, 212, and 213 bulbs. Years ago Walter Lassaley, BSC, instructed me to balance practical’s such that an incident reading of the direct output one foot away from the bulb is one stop over exposure. I have found that rule of thumb gives a realistic output to the practical - the light emitted downward onto the table top and upward onto the wall or ceiling is realistic. After establishing the practical’s output using an incident meter, you then use a spot meter to determine how dense an ND gel is needed to line the inside of the shade so that the shade does not become too hot. 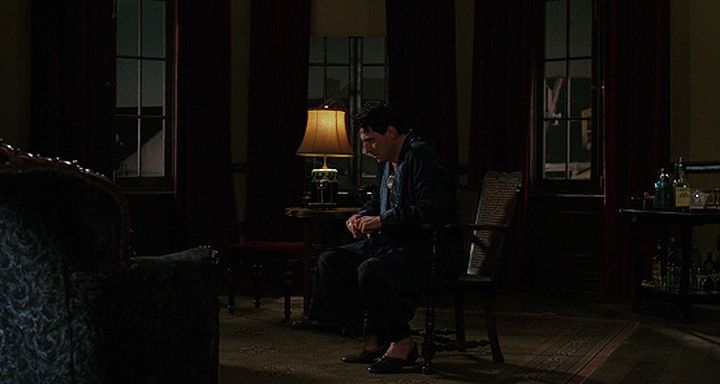 The scene above from “Millers Crossing” lit by Barry Sonnenfeld is a good example. The table practical appears to be the only source of light in the scene, but clearly it takes more than just the table practical to light the room realistically. For a good explanation see David Mullen’s analysis at http://www.cinematography.com/index.php?showtopic=55891 is a good example. Lighting Sales and Rentals in Boston. To get keep this thread rolling here is a repost from another thread "Getting A Similar Look to This Scene from Grand Budapest Hotel." Any thoughts on keeping that look consistent with changing color temp and weather over multiple days? A couple of tungsten 1Ks and an open face 650 won’t be enough to establish continuity between shots over several days unless you can gel the sliding glass doors with an 85/ND9 gel and tent the outside of the doors with a large 12x12 solid. When shooting interiors with windows you have two basic problems: color temperature and the extreme contrast between the interior and exterior. Without either gelling the windows or substantially boosting the light levels inside, when you expose for your talent, your white curtains, which are being backlit by the exterior light, will blow out. If you expose for your white curtains to hold detail, your talent will be underexposed and become a near silhouette and those dark wood kitchen cabinets will become a black hole. Without gelling the windows to 3200K, using 3200K balanced lights doesn’t make a lot of sense. Balancing tungsten to 5500K is not very efficient because full color temperature blue correction gel (Full CTB) cuts the output of the light by 70% in converting it to 5500K. A 1k light becomes a 300W 5500K light when you put Full CTB on it. The output you get after correction will not be enough to light your talent with the windows uncorrected. Covering the windows with a combination 85/ND9 gel will convert the daylight coming in the windows to 3200K so that you can use your tungsten lights at full strength, and it will knock down the level of your white curtains by three stops, so that your tungsten lights will be more effective at reducing the extreme contrast between the windows and the interior. But, where a roll of 85/ND9 gel will set you back $140.00, it will be expensive and time consuming to gel sliding class doors of that size. 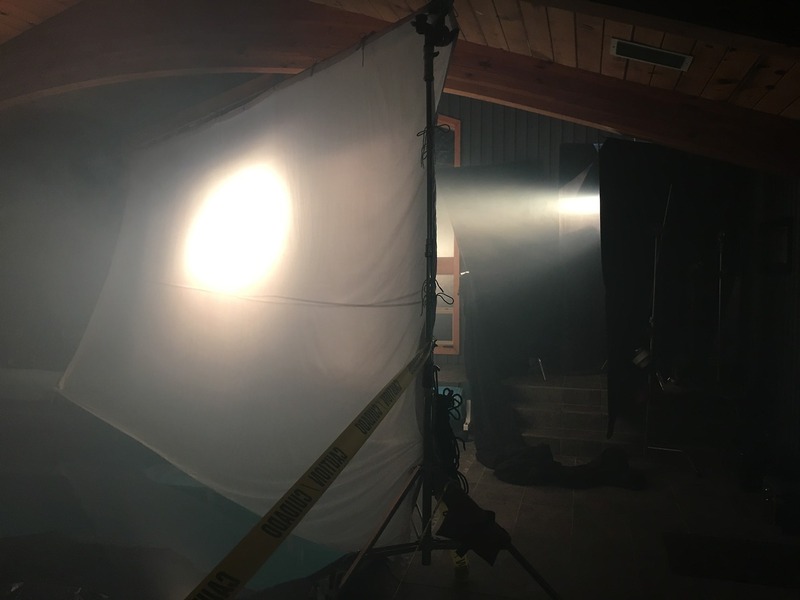 Since it is a long scene that will be shot over several days, you will also need to control the daylight hitting the glass doors from the outside. That’s where the 12x12 tent outside the doors comes in. It will keep direct sun from hitting the doors so that only the “sky shine”, which is pretty consistent throughout a day, will be lighting the backside of the white curtains. But, since there is always the possibility that you will get a mix of sunny and overcast days, I would recommend that you use an HMI outside to throw your own consistent light on the white curtains from outside. The alternative approach is to use daylight balanced fluorescent or LED fixtures inside. A good example of this approach is an American Experience program titled “The Most Dangerous Women in America” about Typhoid Mary that I lit for PBS. For part of her life Typhoid Mary was quarantined on an island in New York's East River. Typhoid Mary in quarantine on an island in New York's East River. Note the view out the window of the East River shoreline at the turn of the century. Because New York’s East River today looks nothing like it did when she was in quarantine, we used a 30' blowup of a picture of the East River at the turn of the century rigged outside the windows of a house in Arlington MA. We wanted to overexpose the exterior by one stop so that it would look realistic and hide the fact that the exterior was a blow-up. 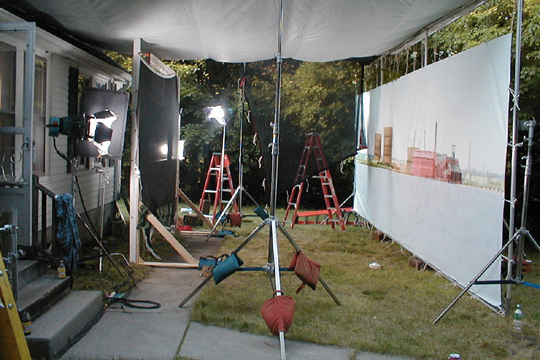 As you can see in the production still of the exterior of the actual location used for the quarantine island, we rigged a solid over the porch windows and the blow-up to keep the sun off both. That way we could light the blow-up and interior so that it remained consistent even though the sun moved on and off the porch in the course of the day. To take the edge off the blow-up, we used a single scrim outside the window to help throw it out of focus. The actual exterior of Mary’s cottage was the backyard of a house in Arlington Ma with a 30’ blow up of a picture of New York’s East River shoreline at the turn of the century. To maintain continuity between shots, we brought a 4kw HMI Par in a window on one side of the room as a sun source and a 1200 par through a window on the other side as a northern light source. We powered both heads off a dryer plug in the laundry room of the house using a 60A transformer/distro. The two 2.5k Par lights used outside to light the blow-up were powered by a modified Honda EU6500is through a second 60A transformer/distro. Since the Honda EU6500is could be placed right on the lawn, we were saved from running hundreds of feet of feeder back to a tow generator. 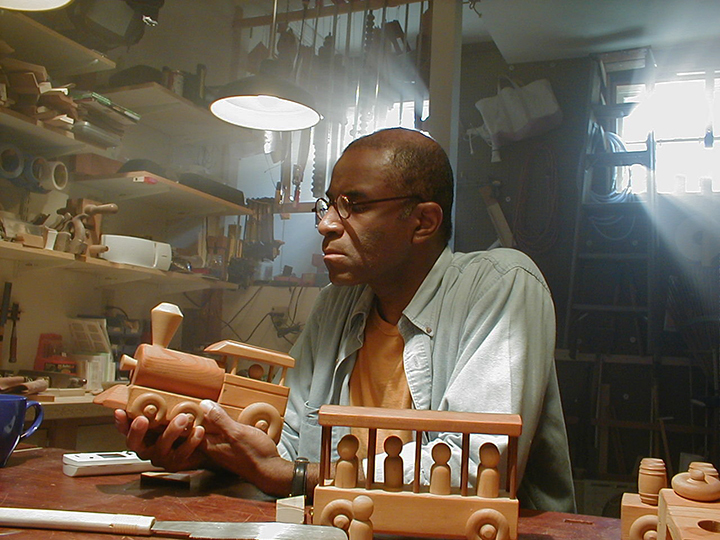 Use this link for more production stills of PBS and History Channel historical documentaries where I took a similar approach. To get keep this thread rolling here is a repost from another thread called "Diffusing sunlight"
I ran into a problem on a shoot I did today. On the outside shots, I wanted to diffuse the sunlight, of course. I had a 2x2 meter diffuser, but I couldn't get it high enough for it do diffuse the whole scene. The sun was pretty much in the middle of the sky, and we were going for quite a high-key look. We are definitely shooting on a very tight budget. Is there any sensible way of doing this, or will I need a lift and a bigger frame in the future? I guess another alternative is shooting later in the day. The scene was set in the outside area of the restaurant with tables and chairs. We had 12 models on the shoot on three different tables. This is one of those situations where scouting, choosing the right location, and planning your production day is worth more than all the grip trucks, tow generators, and large HMIs in the world. In these situations, the approach that I find works best is to choose a location that puts the sun in the backlight position for the establishing master shot and then wait until the optimum time to shoot that shot. Up to and after that point in time, shoot the close coverage under a full silk. Shooting the coverage under a silk offers a number of advantages. If the sun is in the wrong place for scene continuity with the master shot, the silk takes the directionality out of the sun and knocks down its’ level by two and half stops. Now a smaller HMI light will have more of a modeling effect. Shooting into talents' down side under a silk, I find that a 4k Par through a diffusion frame is a sufficient key source for a medium two shot and it can easily be positioned where it needs to be to match the establishing wide shot when you eventually shoot it. A good example of this approach is a scene I lit for a low budget feature that took place around a campfire in a small clearing surrounded by woods. Surrounded on all sides by woods, we knew that we would lose direct sunlight in the clearing early in the day and would need lights. We also knew that the scene was going to take all day to shoot because of its’ extensive dialogue, so we figured out where the sun was going to be throughout the day and where it would look best for our establishing wide shot. Where it was a two shot, mostly over the shoulder of one character talking to the second character that was standing with his back to the campfire with the woods behind him, we decided to wait until the sun had moved into a near back light position to shoot the establishing shot. So we shot our close coverage first with nothing more than a 4k Par and 1.2k Par under a 20x light soft frost on top of which we threw leaves. The 4k was heavily diffused and positioned so that it gave the talent the reverse key modeling that would be consistent with the wide shot but still attractive. The 1.2kw was used bare and was positioned as a backlight where the sun would be when we would eventually shoot the wide - this way there was always an edge in every shot for continuity. When the time came to shoot the establishing shot, the shadow of the overhead frame and stands were thrown forward and did not interfere with the wider framing. Since we were still shooting under the silk, we were wider open on the iris and so our exposure dug into the dark woods and brought out more detail. The smoke from the campfire drifted into the woods, creating shafts of light where the sun broke through the tree canopy. What would have been a high contrast scene without lights, turned into a beautifully lit scene, and was accomplished without a lot of amps. The whole scene was lit with nothing more than a 4k and 1.2k Par and powered by nothing more than a 60A/120 circuit from a modified 7500W Honda EU6500is with a 60A Transformer/Distro. "Years ago Walter Lassaley, BSC, instructed me to balance practical’s such that an incident reading of the direct output one foot away from the bulb is one stop over exposure. I have found that rule of thumb gives a realistic output to the practical - the light emitted downward onto the table top and upward onto the wall or ceiling is realistic." I just stopped whatever im doing to read all this. This forum's a great place to visit. Its time to resurrect this thread with another Indie trick-of-the-trade: lumber grids. One of the hardest looks to accomplish on location is “motivated reverse key lighting". Reverse key lighting is when the quality (color temperature and hard/softness) and placement of a light is motivated by a source (practical or window) in the scene that is upstage of the talent. In this approach, the camera shoots into the shadowed side of the talent creating contrast and a low-key effect. The reverse key position also creates a third dimension to what is essentially a two dimensional medium by means of subtle graduations of light and dark in the scene. 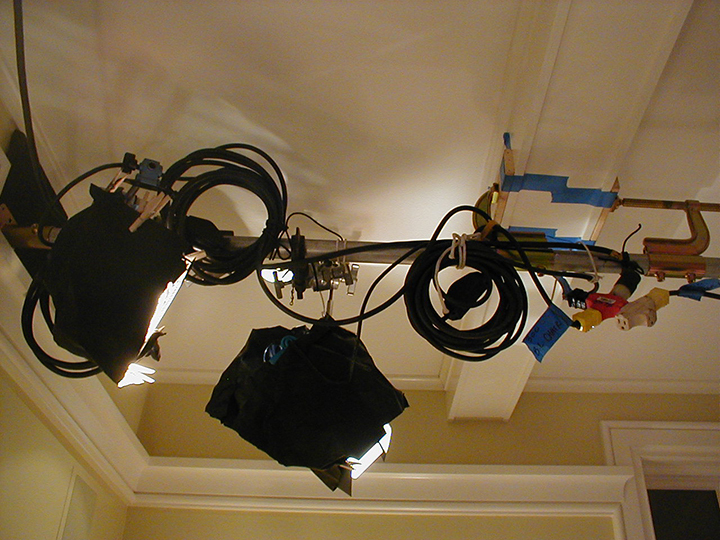 On real locations some rigging is invariably involved in getting the key light in the right place. As can be seen in the pictures below this can be accomplished easily and cheaply with “wall busters,” 2x4s, and inexpensive deck framing hardware. Dramatic motivated reverse key lighting for a Bose spot. 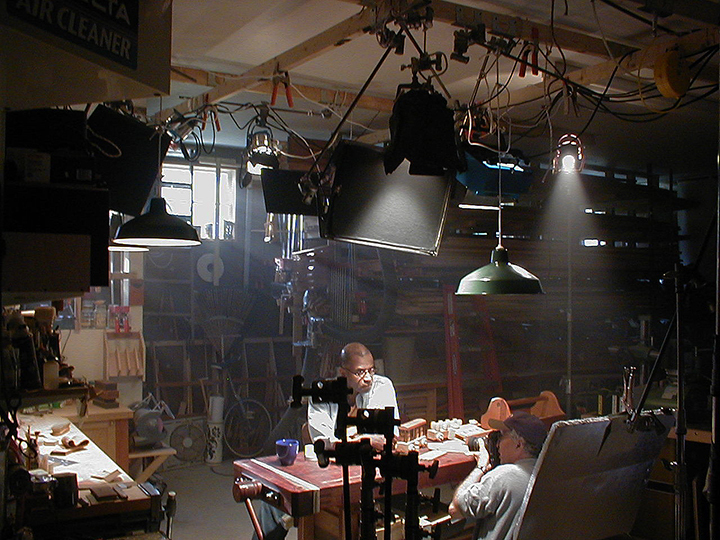 For example, while not a night interior per say, we created a similar low key dramatic lighting effect for the Bose spot above, transforming a flatly illuminated woodshop into a scene with warmth and contrast, with nothing more than 2x4s and deck framing hardware. 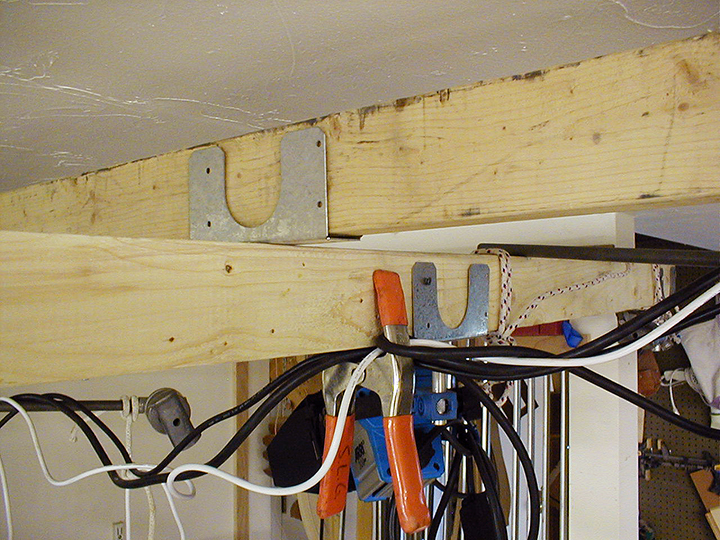 A baby spud on a 2x4 joist bracket will enable you to inexpensively rig a light to lumber. 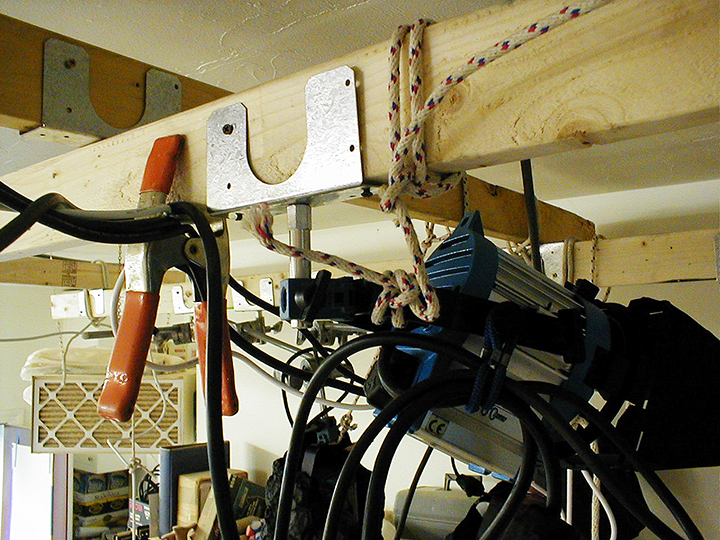 2x4 joist brackets will enable you to quickly construct a lumber grid capable of rigging a light anywhere overhead. We used the “big budget” approach of Speed-Rail Wall-Busters, Speed Cs, and Speed-Rail Pipe to create low-key reverse key lighting for a party scene on another Bose spot. With the right equipment, time, and a little ingenuity there is nowhere that a good grip can’t put a light. 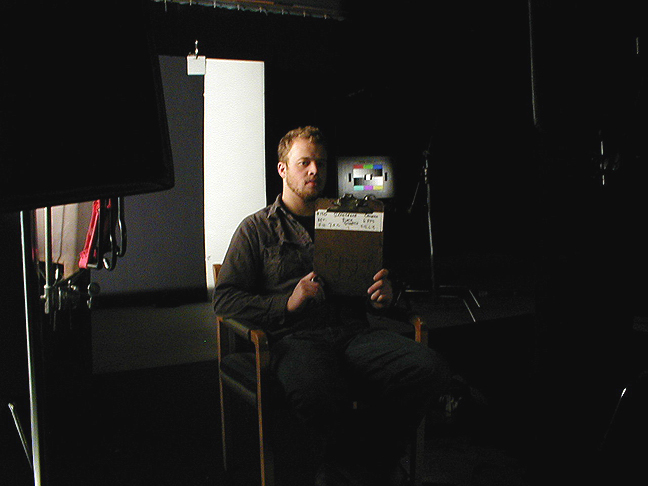 Guy Holt, Gaffer, ScreenLight & Grip, Lighting Rental & Sales in Boston. My only concern with that sort of stuff is the amount of damage it can do if it goes wrong. I've done things vaguely like that, on a much smaller scale, but I generally use combo stands where I can, with junior pin to scaffold clamp adaptors (which are referred to as various things worldwide.) Aluminium scaffold tube is expensive, but easier to rig, I think. Big Bens.....in the UK, what are they called? Is there a way for someone like me to start using a generator so that I might power an M40 or an Arrisun 60?...There doesn't seem to be a lot of people at my stage of dabbling with use of bigger lights or more power. Most everyone I find is using tow-gennys with a crew or sticking to smaller lights and LED fixtures. 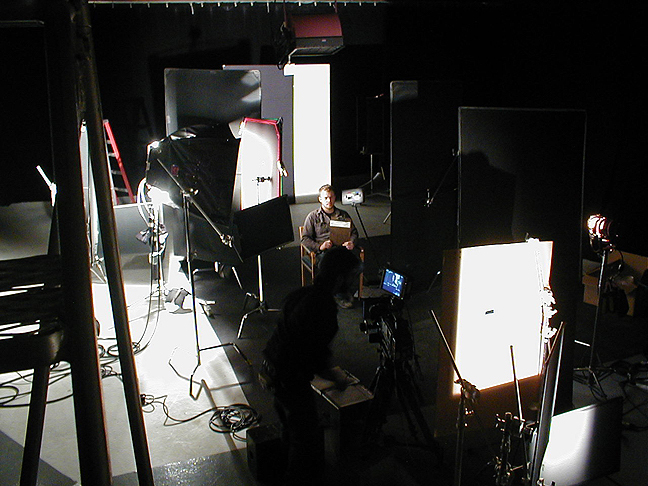 One of the biggest hurdles to obtaining good production values in low budget digital cinema productions is the high cost of the blimped studio generators required to power large HMIs. Not only are blimped generators expensive to rent, but they also come with hidden costs. Since rental trucks like those from Ryder or Penske are not equipped to tow, you quite often have to pay extra to have them delivered or hire the rental house's grip truck to tow them. And, since most rental houses require that one of their employees drive their trucks and operate their generator (for insurance reasons), the production has to hire a driver/genny op at roughly $575/10hrs - which is probably more than anyone else on a typical indie crew is getting paid. All of this makes the use of large HMI lights very expensive. The introduction of larger paralleling inverter generators, like the Honda EU7000is, makes the use of large HMIs more affordable and more accessible. While it requires a basic knowledge of electricity to distribute power from a large diesel generator, the use of a step-down transformer with a putt-putt generator can greatly simply powering large HMIs up to 12kw. When using large tow plants, it is the Best-Boy Electric’s job to carefully balance the lighting load over the legs of the generator and avoid voltage drop by using sufficiently large cable. With a transformer and a putt-putt you don’t have to worry about either. You don’t have to worry about balancing loads because a transformer automatically splits the load of whatever you plug into it evenly over the two legs of the 240V circuit of the generator. It balances the load so you don’t have to. A combination transformer/distro with a Bates receptacle will enable you to power larger lights (like 12kw HMIs or 10k Tungsten), and more smaller lights, than you could otherwise. It also enables you to use standard film-style distro equipment, like Bates extension cables, Siamese (splitters), and fused Bates-to-Edison Breakouts (snack boxes), to simplify the run of power around set. And the best part about transformer/distros is that regardless of how much distro you lay out, no matter where you plug in a light, the transformer/distro automatically balances the additional load. With a transformer/distro you simply plug in your lights until the load displayed on the iMonitor of the generator/s control panel reaches 7500Watts. An overload alarm on the iMonitor display will tell you if you inadvertently overload the transformer/distro. A transformer/distro will also enable you to record sound without picking up the noise of the generator/s by enabling you to move the generator/s off set (like you would a Crawford), but still provide plug-in pockets conveniently close to set. Two to three hundred feet of heavy duty 250V extension cable is usually enough to place the generator around the corner of a building, or to run it out of a van or truck - which is usually all the additional blimping you need with these generators. The heavy-duty 250V cable also minimizes the voltage drop you would have using standard electrical cords. To assure full line level (120V) on set, our transformer/distros are designed to compensate for the slight line loss you will have over an extended cable run by boosting the voltage on the load side (secondary.) For example, when the supply from the generator/s to the (primary) of the transformer drops to 228 volts because of line loss, 120 volts still comes out on the secondary side where you plug in the lights. This slight boost enables you to place the generator/s further from set where you won't hear then, yet assures that the supply voltage on set does not drop too low. A 60A Shock Stop provides ground fault protection for the 60A/120V circuit derived from a transformer/disto and a single Honda EU6500. Finally, one of the greatest benefits to using a transformer/distro with a Honda EU7000is has got to be the ability to meet OSHA requirements for the use of these generators on job-sites. So that GFCIs operate reliably, OSHA requires that generators used on job sites bond the Neutral and Ground. Honda EU7000s out of the box don’t. But, since transformers bond the Neutral to Ground on the secondary load side, they meet that OSHA requirement. To bring the Honda EU7000is into full OSHA compliance, now all you need is to add a film-style GFCI, like a Shock Stop (pictured above), downstream of the transformer/distro. With a Honda EU7000is and transformer/distro you don’t have to be an experienced electrician to provide clean, stable, and safe power on set. A good example of how a transformer/distro simplifies set electrics and enables you to record clean audio tracks, even under the worst circumstances, is the independent feature “Gasp” which used a Honda EB10000 to film an important beach scene at night. Generating 72dbs at 23', the Honda EB10000 is more than twice as loud as an EU7000is. Left: Honda EB10000 operating out of grip truck (note set at distance (bright spot on right side.)) Center: 84A Full Power Transformer/Distro compensates for Voltage Drop over 400ft cable run. Right: Beach Set with 120v full line level 500ft from power source. To remedy that problem the crew of “Gasp” used one of our 84A transformer/distros to compensate for the voltage drop they experienced running the generator out of the back of a box truck 500 ft. from set. With the transformer/distro close to set they then ran 100A Bates Extensions around their set and broke out to 20A Edison receptacles using 100A gang boxes in order to power an assortment of smaller tungsten fixtures to simulate the firelight and an ARRI M18 to simulate moonlight on the actors around the fire. To light the deep background the crew put a 240V Siamese in-line before the transformer/distro to power a 6kw HMI Par. 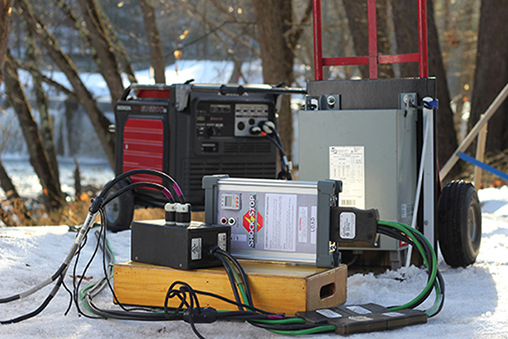 Even with such a sizable load, they experienced no appreciable voltage drop on set after a 500' cable run because the transformer/distro compensated for both the line loss of the cable and voltage drop of the generator under near full load. sunny summer day even when filming in the midst of a hurricane in October. The principle location for "Gasp" was an idyllic beach house right on the ocean. To light interiors of the beach house, the crew of "Gasp" used two 4k Pars outside, and an assortment of smaller HMI and Kino fixtures on the inside. The smaller fixtures were plugged directly into the house, while the 4k Pars were powered by the EB10000 running in the back of their grip truck. Left: Ready for rain on the set of "Gasp." Center: Two 4kw Pars operate on a 10kw Honda EB10000 Generator through our 84A Full Power Transformer/Distro. Right: 100A Shock Block GFCI downstream of the transformer/distro offers Ground Fault Protection for the entire 100A distro system. The indie film "Gasp" is a good example of how a transformer/distro can greatly simply set electrics so that you don’t have to be an experienced electrician to power a set. It makes it possible to record clean audio tracks with even generators as loud as the EB10000 even under the worst of conditions. Do you find you have to fire HMIs up sequentially when you're operating close to the limits of what the generators will do? I find metal halide lighting in general can pull a lot more power when it's warming up. It depends on the type of ballast. Because of the constant improvement in HMI technology over the years there are several types of HMI ballasts available and if you are not careful how you power them you can get stuck. In ballast design you have a choice between magnetic and electronic ballasts; and to complicate matters even more, you have a choice between Power Factor Corrected electronic ballasts and non-Power Factor Corrected electronic ballasts. Magnetic ballasts draw more current during the striking phase and then they “settle down” and require less power to maintain the HMI Arc. For this reason, as Phil suggests, you can’t strike them all at once because you must leave “head room” for their higher front end striking load. For the same reason you can’t load a generator to full capacity with HMIs with magnetic ballasts. By contrast, an electronic ballast “ramps up.” That is, its’ current draw gradually builds until it “tops off.” But, unless the ballast is Power Factor Corrected (PFC), an electronic ballast will draw more current than a magnetic ballast of the same wattage. Why ballasts of the same wattage will draw appreciably different current has to do with the Power Factor of the ballast. Since Power Factor Correction (PFC) is not mandatory in this country as it is in Europe, you will encounter many non-PFC HMI, Kino, CFL, & LED power supplies. And since, the adverse effects caused by a poor Power Factor go beyond an inefficient use of power, it is well worth understanding Power Factor and why it should be corrected. 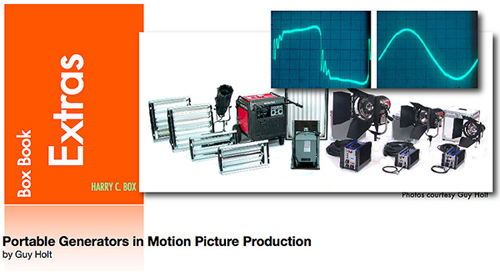 To learn more about HMIs I would recommend an article I wrote on the use of portable generators in motion picture production. "Great work!... this is the kind of thing I think very few technician's ever get to see, and as a result many people have absolutely no idea why things stop working." "Following the prescriptions contained in this article enables the operation of bigger lights, or more smaller lights, on portable generators than has ever been possible before. It takes more skill to make an indie film than a big budget studio picture. Where a Hollywood production can throw money at a problem, an indie production must work smart. I have started this thread as a place where we can share indie tricks-of-the-trade for realizing big budget production values on a modest budget. To get back to the original purpose of this thread: to share the tricks-of-the-trade that will add more to a film’s production value than all the big budget toys found on bloated Hollywood productions. No one tool on your grip truck will improve the look of your film more than what you see in your mind’s eye. Having a vision of what you want to accomplish and the analytic tools to realize that on set, will save you more money than any piece of equipment you can buy. Nothing is as important in film production as preparation. With the right analytic tools you can light a scene on paper down to a level of specificity that includes the choice of lights, their placement, and the Foot Candles they will project onto your subject or set. As a starting point choose the exposure of the key tone for the scene at the outset - say T5.6 for deep focus. Having chosen the exposure, one can calculate how many Foot Candles (FC) is needed on different elements of the scene. To figure out how many FC you need for exposure, all you need to know is that it takes 100 FC to get an exposure of 2.8 with an ISO 100 film with a 180 degree shutter at 24 FPS (1/50th of a second shutter speed.) If your digital camera is 2 stops faster than an ISO 100 film, you will need 100 FC to get a stop of 5.6. Once you know how many FC you need for exposure you can simply calculate how many FC will give you the effect you see in your mind’s eye. Of course, it helps to have done a lighting test of what effect over and underexposing a subject will give. Put all the scrims back in and now, using single and double nets, systematically under expose the flesh tone in half stop increments (remember rotating a net relative to the light source will make it "fatter" or "thinner", which will enable you to "dial in" the exact level you want from the light.) If you plan to play on the lower register in your film continue to under expose the flesh tone until it becomes a pure silhouette. Do the same for Fill, Back Light, Kickers, Hair Lights, and Liners in isolation and in specific combinations that you plan to use them. Having systematically tested each light, you can now see the effect that different ratios of each has on the scene and can even use the test as a reference on set when lighting the scene. An example of this type of pre-visualization would be say you plan to shoot a couple conversing at a bar. After working through in your minds eye that you want a low-key look with selective (shallow) focus you might settle on a stop of 2.8. Say the script calls for the guy to be somewhat mysterious and distant and the women to be very open and appealing, then you may choose to keep him in deep shadow with just enough of a liner to separate him from the subdued background of the bar. This type of lighting on him could be motivated by a practical fixture you establish behind him, which would be consistent with the more frontal key you want for her, since you would want to light her more frontally so that her character is clearly apparent. Having roughed out your style and light placement you can begin to set your levels and balance your lights on paper based on your lighting test. For instance, if your camera is two stops faster than an ISO 100 film, you will need 24 FC to properly expose your key tone (mid gray) at a T Stop of 2.8. 24 FC would then give you a “properly” exposed flesh tone on her. But this is a bar with subdued lighting, so you don’t want full exposure on her. You liked the feel of a half key (1 stop under) in your lighting tests so you would light her with 12 FC. To create the glamor modeling you are after you choose a soft source from a high frontal key position. To maintain the low-key effect you are after for the bar, you choose a baby soft light with egg-crate to control the spread of light. Again, because the scene takes place in the subdued lighting of a bar, you don’t want to over fill her. Going back to your lighting tests you like the look and feel of an 4:1 key to fill ratio so you would give no more than 3FC of a soft fill light. You need to separate her from the dark background of the bar and so you might give her a backlight of 6 FC because that's what looked appropriate in the lighting tests to separate her hair color from a dark background without looking over-lit. Since you want to play him in near silhouette, you choose for her backlight a small Fresnel with diffusion inside the doors, that you will be able to cut with a flag to assure it does not spill on him. That way no more than the 1 FC, that according to your film tests is required to keep him in silhouette, will fall on him. For the liner to separate him from the dark background of the bar you will need a fairly strong fixture capable of delivering 48FC from directly behind him since your lighting tests established you need to be at least a stop over exposure for the liner to read. Once you have figured out how many FC you need for the effect (a liner in this case) you can figure out which light will give you that using the photo-metrics that manufacturers provide on their websites, or you can download Arri’s handy photometric calculator (be wary of the photo-metrics given for LED lights.) With a little experience you begin to develop a feel for what light will give you what you need in different situations. In this case, a leko instrument is the best choice because it will deliver the Foot Candles needed while giving you the ability to easily cut the spill of the light. It is worth noting that in this example no one light gives full exposure (24 FC.) Instead, your light levels are pitched over and under the key tone to create the effect you are after. You can do all of this pre-visualization, setting of levels, and balancing of lights on paper. In other words, almost everything can be worked out ahead of time so that when you arrive on set you know exactly what you need to do. Such preparation is essential on low budget projects. The time spent with minimal crew in scouting and blocking with stand-ins, is considerably less than the time wasted working these things out on set with a large crew and principle talent. If I may, I would like to contribute a set up I did for a $500k feature I did last year. In the film, two characters must use a canoe to return from an island to their coastal home. However, their return home becomes dangerous when a thick fog rolls in. Inevitably, they become lost. I only had a 3 ton grip truck for this feature, supplied by my gaffer Jarrod Wilson of Pirate Grip/Electric. Joe Paulet was my key grip for this project. My plan was to find an inclosed pool, block out all sun light, black out the pool, and then fog the crap out of the room. We found a pool that was 20'x40' long. We were scheduled to have one whole day to shoot this sequence. I split my G/E team of 4 up the day prior to send 2 of them for pre-rigging. 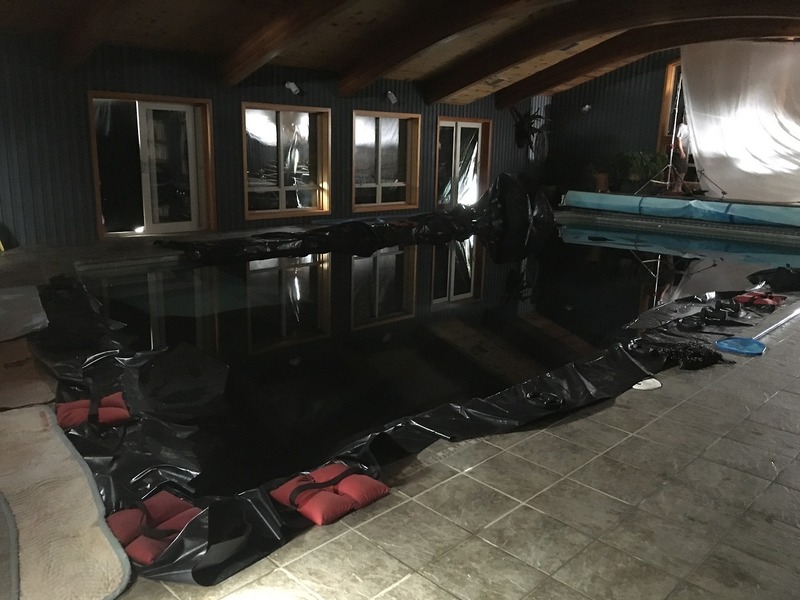 Most of the pre-rigging was spent on blacking out the pool. On the day, we continued to black out the pool and then blacked out all the windows. Once we got our "base" made, we began to light. I used a 1.2 PAR HMI shooting through a 20'x20' half grid (folded up to 20'x10') as our sun. Our key light was a 1k Baby with FCTB bouncing off a 4x4 beadboard. We used an industry standard fog machine, the name of which is escaping me. I think it was a 12AMP fogger; Jarrod would know. To make moving the camera easy, I used a Matthews Intel-A-Jib hard mounted to a doorway dolly on track. This allowed me to float the camera over the water instead of going handheld, preventing any risk of me slipping with the camera. Plus, it smoothed out all of my camera movement! 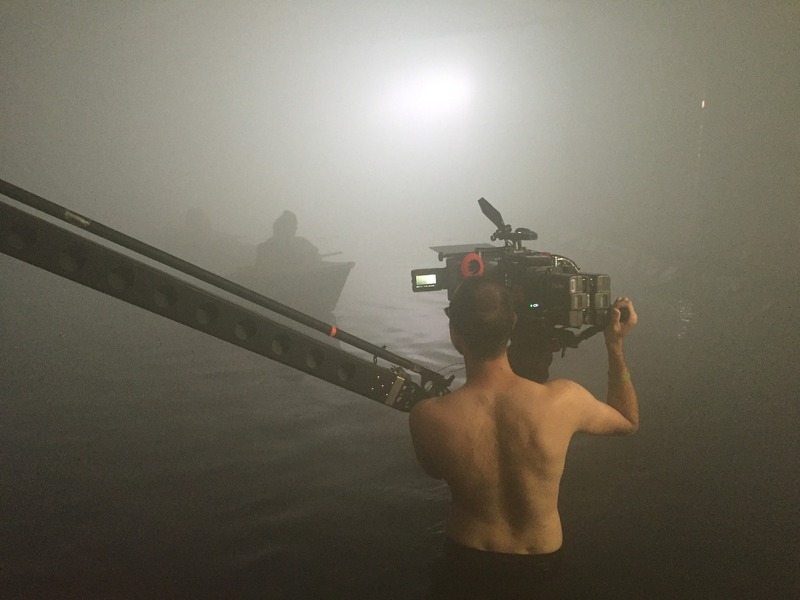 :) Joe would operate the dolly while I operated the head/jib in the water. This set up proved to be super helpful with getting the various angles we needed. 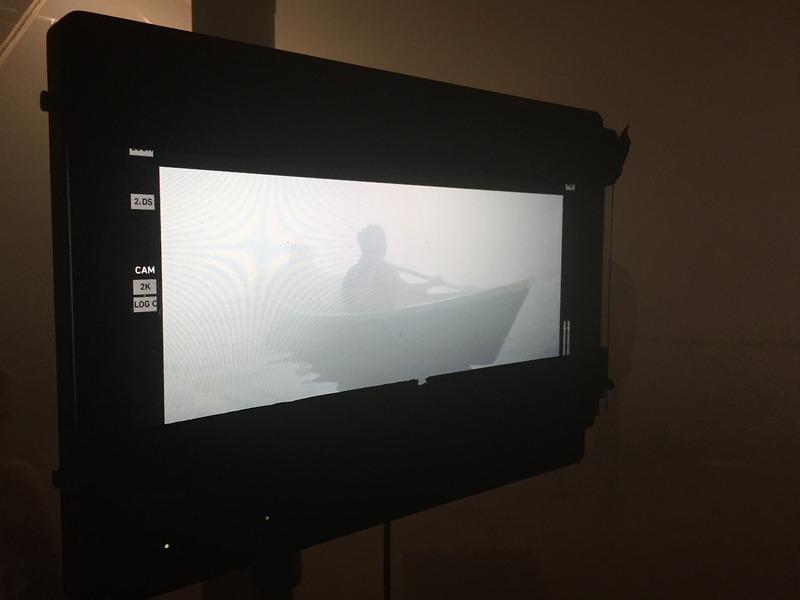 The fog was so thick that the color temperature of the 1.2 HMI went closer to 4300K, so we regelled the 1K Baby accordingly. We were able to set up, shoot, and tear down in a 12 hour day with 4 hours of pre-rigging the day before. I'm beyond proud to have had Jarrod and Joe work with me to attain some marvelous results. I'm doing a similar set up like this again on a feature in three weeks; I'll share photos from that too! I hope this is helpful! Let me know if I need to elaborate on anything. Looks great, like a small scale version of what they did for the opening of "Snow Falling on Cedars". I hope my experience and photos can help others at similar or smaller budgets. It IS possible! :) Great thread idea, guys. I think Ridley talked about "dark, wet, smoke" when he described how they made Blade Runner look good. Those shots look awesome AJ! What focal length lenses did you use for the scene? Did you have any issues seeing off the water's edge, or did the smoke sufficiently hide that? We used anamorphic lenses and mostly used the 40mm and 50mm. There was the occasional use of the 75mm, but we didn't want to risk fogging up the sensor and real element too much. We discovered the sensor fogging immediately after the first lens swap, so we then swapped lenses outdoors. Unfortunately, that took a lot of time, so we ended up riding the 50mm a lot. The fog did an excellent job, but then it would start to dissipate during longer takes. There were a few shots where we could see the edge of the pool, but our characters didn't cross them. We agreed that we could use set extension in post and cover the exposed edges with CG fog, a la After Effects. Nice, thanks for the details. Keep up the great work! Hey Guy, this is awesome, thanks so much for your articles and contributions they have made a big difference for me and my understanding of lighting. I have a feature I'm shooting in July, with a few car days and I would like to use this technique with a hive wasp 250W par. We'll be towing a car in the uhaul tow and using the rosco black scrim. I have a few questions about tie-ing to the car. From research I've found that if the battery are run in parallel, I'm going to have to find a battery that has similar specs to the uhaul truck battery doing the tow, is that correct? And is there anything I should be looking out for spec wise to be exactly the same? The wasp should be pulling 25 amps paper amps from the 12 volt battery before voltage drop. I was planning to run 12 feet from the car battery to the bed of the truck for the second battery and 3 feet to the pure sine wave inverter, and I was planning on 4 gauge wire. My math was that the resistance per foot was .00024 so the .00024*30ft*25amps=.18 Volts for voltage drop. So the draw will be 21 amps. How much voltage drop is too much for a 12 volt system? 2/0 is pretty expensive, if I'm only running the hive which should have a pfc of 1, would the 4 gauge cable and a 400 watt pure sine wave inverter work for that distance? You don't want the same type of battery as the tow vehicle. Those batteries are for Starting and don't have a long life span when drained down and charged, you want a Marine/RV battery as they are designed for multiple charging cycles.